Chikankari Embroidery – India is the home to variety of embroidery since ages and Indian embroidery has always been a tradition and a name to conjure with. The most elegant and graceful hand embroidered sari from Lucknow, UP. The art came to India from Persia with Noor Jehan, the queen of the Mughal Emperor Jehangir and was patronized by the nawabs for many years. Origin of the term Chikankari has different explanations. As per one version, the word Chikankari has been derived from a Persian word Chakin or Chakeen, which means creating delicate patterns on a fabric. According to others, it may be a distorted version of Chikeen or Siquin, Yet another explanation ascribes the term to the East Bengal language, in which Chikan meant fine. Famous Graceful Chikan design motifs creates on fabric is Ghaspatti-ka-phool. 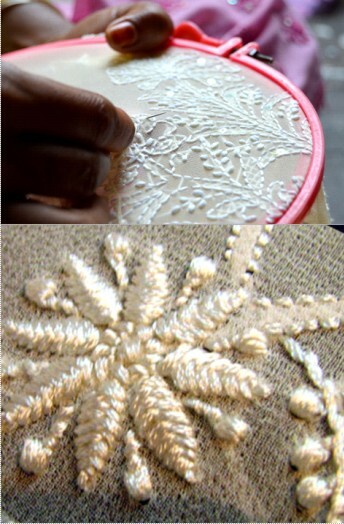 Chikankari embroidery involves about 40 different stitches, with 6 basic ones on which the others are built. Each stitch has an individual name, involves a specific number of threads and has a specific use. It is never used in another part of the design. Each stitch is the representation of a particular purpose. Rahet, for instance, is a stem stitch worked with six threads producing a solid line of backstitch on the front of the fabric, and is used only as an outlining stitch. Finely detailed, dense floral patterns with knots, pulled network and other textural elements are characteristic of this work. The delicate Jaali work creates on the base fabric with the thread. The design motifs in Chikankari are predominantly influenced by Mughal art. The bel or creeper is the most commonly used design individual motifs or butis, animals and flowers are also made including fish, hathi (elephant) and kairi (mango), dhaniya patti (corriander leaf) ghas patti (grass leaves V-shaped line of stitches worked in a graduated series) murri (grain motif – diagonal stitches are worked several times on a basic stitch to form a grain shape) and many more. Noor Jehan’s personal preferences and desire to replicate the Turkish architectural open-work designs is said to have that led to the introduction of jaalis in chikan embroidery. The designs in chikan are graded and used according to the stitches employed. Chikankari is a delicate and artfully done hand embroidery on a variety of textile fabric like muslin, silk, chiffon, organza, net etc. Though it originated as a court craft, today it is a practiced tradition and an important commercial activity. White thread is embroidered on cool, pastel shades of light muslin and cotton garments. Lucknow is the heart of the Chikankari industry today it is known as Lucknawi chikan.